This is a sponsored post written by me on behalf of Libby’s® for IZEA. All opinions are 100% mine. 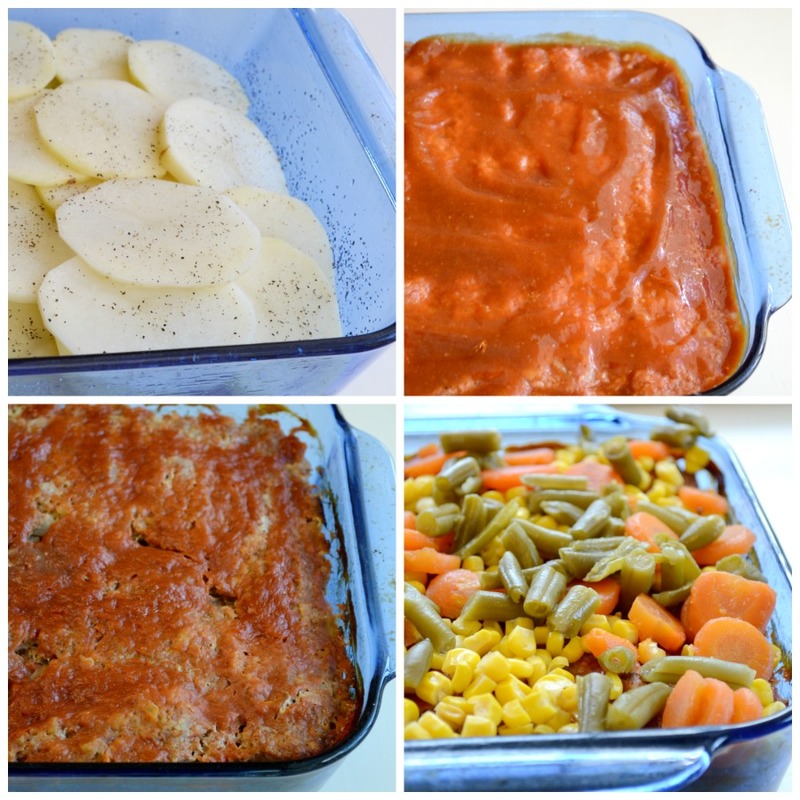 This easy, one-dish meatloaf recipe combines meatloaf, potatoes, and vegetables in a family pleasing meal that can be customized to suit everyone’s individual tastes. Simple, one-dish meals that cover all of the nutritional bases are pretty much a mom’s favorite thing EVER, right? I’m always looking for dinner ideas and recipes that will reduce the number of dishes I need to use, and the number of steps I need to take. The catch is, I also want to serve meals that are well-rounded, nourishing, and really tasty. It’s kind of a tall order. Ever since the girls have gone back to school, we’ve been super busy with after-school activities, weekend events, and daily life. Inevitably, our dinner routine has suffered a little. The other day, my daughter mentioned that it had been a really long time since I made her favorite meatloaf recipe with crackers for dinner, and she was right. Even though it’s something we all love, it’s typically not something I make on a weeknight. When you’ve got to mix and bake the meatloaf, separately cook potatoes, and then separately cook vegetables and/or make a salad, it becomes a lot of work. So, I decided to get creative. 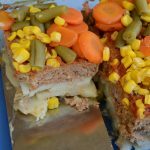 I saw someone making shepherd’s pie on TV, and I wondered if I could create a similar one-dish meal using meatloaf. It turns out, I could! In this recipe, the meatloaf and potatoes are baked together, and the veggies are cooked in 60 seconds in the microwave; so dinner comes together easily AND all at once. Another factor that comes into play when I’m developing family-friendly recipes is trying to find something that’s customizable. My daughters are actually pretty good vegetable eaters, but getting them to agree on which vegetables they like is a challenge. What one loves, the other hates, and vice versa. 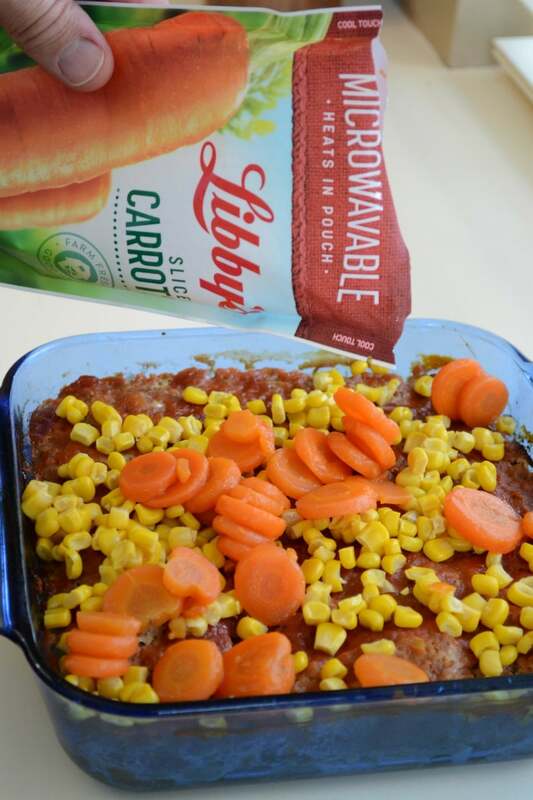 Thankfully, those “What veggie should we have tonight?” debates have been resolved by Libby’s® Vegetable Pouches. They come in five favorites — Sweet Peas, Cut Green Beans, Sliced Carrots, Whole Kernel Sweet Corn and Mixed Vegetables — so everyone can find something they love. They also cook in less than 60 seconds, which means you can have hot, nutritious vegetables on the table in an instant. 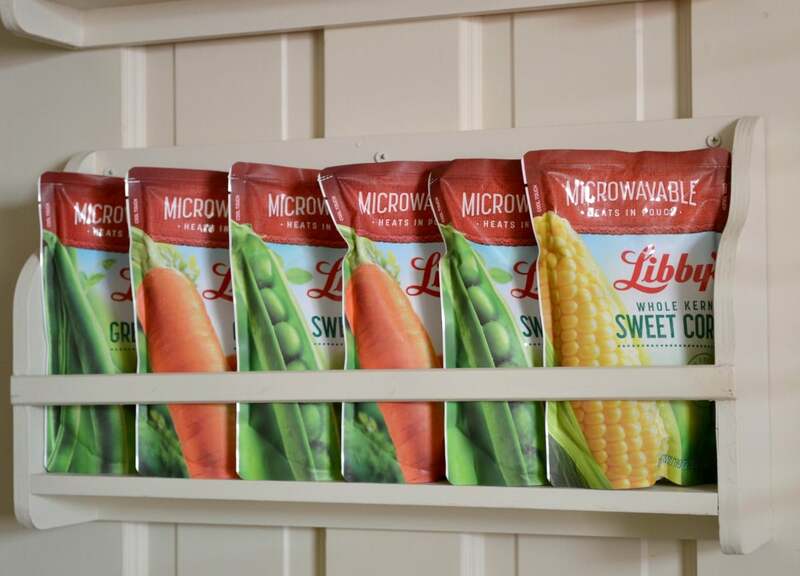 Libby’s® Vegetable Pouches contain the same wholesome, farm-fresh vegetables you find in Libby’s® cans. As you can see, they stand up straight, are flexible, and fit nicely into kitchen cabinets, taking up less space in your pantry than cans typically would. The pouches are shelf stable (no need for refrigeration), which means you can stock up without taking up room in your refrigerator or freezer. 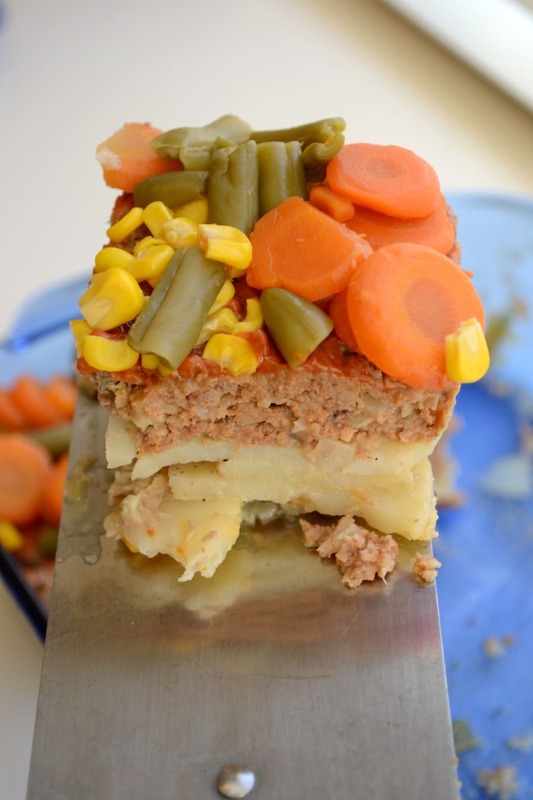 If you’re looking for a simple, but tasty meatloaf recipe that will also get your kids to eat their veggies, this is it! I hope you enjoy it as much as we all did. An easy one-dish meal for family dinner nights. Lightly grease the bottom and sides of an 8x8 or 9x9 square baking dish. Thinly slice the potatoes (about 1/8 inch slices) and layer them on the bottom of the pan, sprinkling each layer with salt and pepper. In a separate bowl, combine the ground beef, salt, pepper, onion, egg, tomatoes, and crushed saltines. Spread the meat mixture evenly over the top of the potatoes. Mix the ketchup, brown sugar, and mustard and spread over the meatloaf. When the meatloaf is done cooking, microwave your vegetable(s) of choice and drain the liquid. 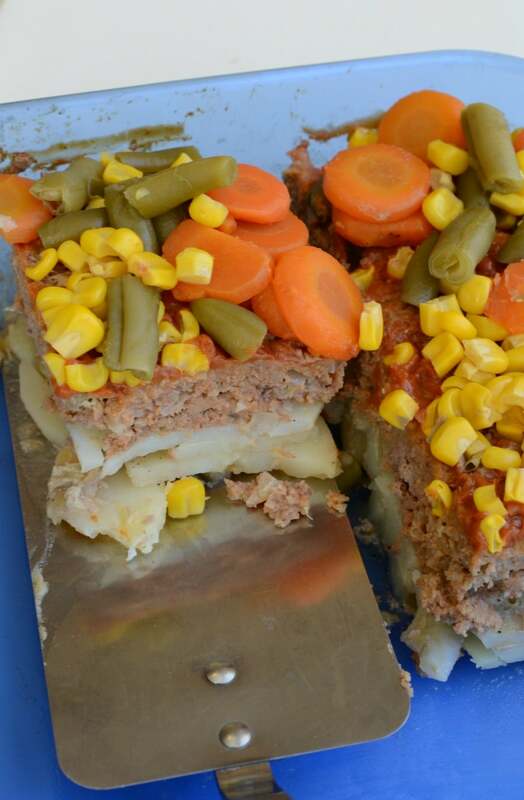 Spread vegetables across the top of the meatloaf. If you'd like to cook this in a 9x13 baking dish, just double the recipe. You can learn more about Libby’s® Vegetable pouches and get great ideas for incorporating these vegetables into your nightly dinner routine by visiting www.getbacktothetable.com. or following Libby’s®​ on Facebook, Twitter, and Pinterest. I don’t see the actual recipe for this meatloaf? Am I missing it? Sorry about that Kelli – there was a glitch that made the recipe disappear. I fixed it, so you should see it now. Thanks for alerting me!